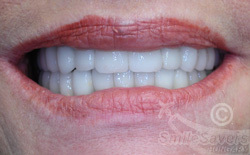 Teeth whitening can be used to effectively remove stains and with laser whitening systems to actually go further and bleach or whiten the insides of the teeth - the area of the tooth called the pulp which can quite naturally be varying shades of yellow which shines through the outer tooth enamel thus yellowing the the overall colour of the teeth. Laser teeth whitening very effectively removes this yellowing and thus more powerfull than home bleaching kits which only treat the outside of the teeth. Prices for laser teeth whitening vary according to sophistication but in the UK the blue-light teeth whitening treatment costs upwards of £500 whereas in Hungary around £350 is normal. 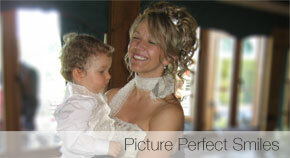 There are other treatment systems available including Zoom and SoniWhite. What does the whole teeth whitening procedure look like? What teeth whitening system is being used? ...The clinic was great, dentists made me feel at ease, the treatment was of a very high level (I've been to lots of dentists both in the UK and Australia). Our client decided to visit us for a London consultation when her front tooth broke off by the gum line and there was urgent need for a full mouth rehabilitation. 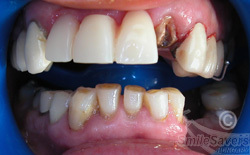 Her dental treatment in Budapest included dental implants and fixed bridges.